For Love of the Paint: Holiday Open House at Red Door Lane! Holiday Open House at Red Door Lane! I am so grateful to be a part of a group of artisans at Red Door Lane! We want to celebrate our clients by welcoming you all to a Holiday Open House THIS THURSDAY, December 10th, 2015 from 4:00 to 8:00 PM. There will be prizes, hors d'oeuvres, drinks, discounts, and general merriment! 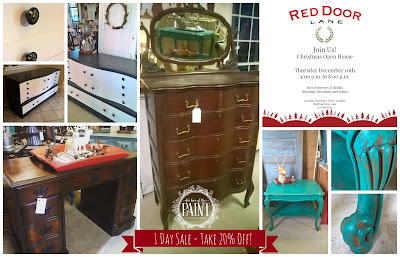 PLUS take 20% off all in-store For Love of the Paint pieces, one night only!!! Hope you can join us!! We wish you and your loved ones a wonderful holiday season and a very happy new year!